We’ve all heard of Microservices, Streaming data, Event Sourcing and CQRS - these are hot topics these days. But what about the less flashy stuff, like concurrency, routing, self-healing, persistence, clustering, and delivery guarantees? These are all things you need in order to get distributed systems done right. The Akka toolkit makes all of this simple for Java and Scala developers who don’t have time to deal with all the low level plumbing and manual wiring. Lightbend clients and industry leaders like Amazon, LinkedIn, Starbucks, Verizon and others get all these features out of the box, in addition to Akka's commercial features that come as part of Lightbend Enterprise Suite. So what makes Akka so special? Well, as an Akka veteran who has built distributed systems with everything but the kitchen sink before discovering Akka nearly a decade ago, our Developer Advocate Hugh McKee is the ideal person to break it all down for us. 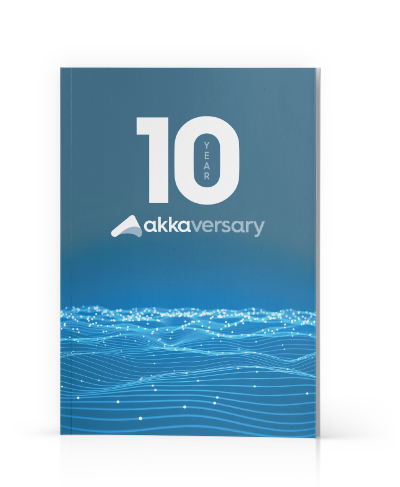 Check out this illustrated journey that goes deep into how Akka works–from individual Akka actors to fully distributed clusters across multiple datacenters. To learn more about Akka, visit the Lightbend Tech Hub for docs, guides, rapid project starter and more, as well as links to Akka.io, the Akka team's OSS website. In addition, you can learn a lot from reading the blog of Colin Breck, a frequent speaker at Reactive Summit and Scala Days, who shares his experience with Akka Actors, Akka Streams, and more.